Some years ago, after I had made a decision during a game, one of the players said to me, ‘It’s a good job this is not televised ref, otherwise you would find out that you made a mistake there’. ‘On the contrary’, I replied, ‘I wish it was and then the replay would show you that I was right’. I think that’s how many Premier League referees must feel when they put their feet up to watch Match of the Day on Saturday evening and see that a decision that created controversy at the time is proved correct by the replay. The problem is however, it doesn’t seem to matter, even if the replay shows he has made the right decision, he can still get the blame if a team gets beat. In the Norwich vs. West Ham game recently, Chris Hughton, the Norwich manager claimed that Mark Clattenburg had ‘killed the match’ by awarding an early penalty to the Hammers After seeing the replay of the penalty decision, he said that he accepted his player Bennett, had hold of the shirt of Reid, the West Ham player, ‘but he was not pulling him back.’ The Law says quite simply, ‘A direct free kick is awarded if a player holds an opponent.’ Holding can take many forms but nowhere does the Law mention that it is only a foul if the offender is actually pulling his opponent back. Holding is one of the ten direct free kick offences, so if it happens in the penalty area by a defending player, then it is a penalty. Chris Hughton would be better employed in telling his players not to hold on to opponent’s shirts, particularly in the penalty area, than berating the referee for applying the law correctly. One of the other key decisions Hughton complained that ‘didn’t go their way’ was the non-giving of a penalty against West Ham for handball. Handball often causes controversy when given or not but in this case the replay again showed that Clattenburg was absolutely correct in turning it down. 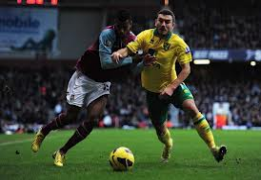 A Norwich player kicked the ball into the penalty area and it hit the arm of a West Ham player, who was a short distance away and moreover was falling down when the ball hit him. The player’s eyes were not on the ball but on the ground that he was soon to hit. The Law says that ‘a direct free kick (penalty) is awarded if a player handles the ball deliberately’. One simplistic way of describing this is to say it is ‘hand to ball’ rather than ‘ball to hand.’ The West Ham player’s arm was quite clearly hit by the ball as he went down and there is no way anyone could consider that he deliberately moved his arm with the intention of playing the ball. Chris Hughton’s other complaint was when Tettey, a Norwich player, went to ground just prior to West Ham’s second goal. ‘I have seen it again’ he said, ‘and it gets worse every time I see it’. What the replay actually showed was the West Ham player running with the ball in front of him, when Tettey cut across, putting himself between the opponent and the ball. Perhaps not unnaturally, there was a tangle of legs and Tettey went down. But in those cases the referee has to ask whose fault was it? Not the West Ham player was Clattenburg correct interpretation. So although the replays showed that he had in fact got the key decisions correct, he still got the blame for Norwich’s defeat. One thing is certain if you are a referee, even with the replays on your side, you just can’t win.